This autumn Send My Friend to School Campaign Champions joined Zambian Young Ambassadors – Chimunya and Aquila – to take the #MakeSchoolsSafe call to Conservative and Labour Party Conferences. Here Lily Stevens, aged 15 from Alun School in North Wales, reports back on her experience representing Send My Friend at Labour Conference. 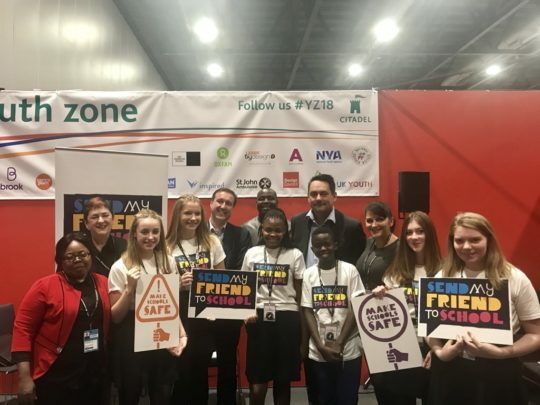 On the 23rd of September, the Send My Friend Campaign Champions attended the Labour Party Conference alongside Oxfam to meet with Labour MPs and spread the message that every child should receive a safe education and to make everyone aware of our fantastic campaign to Make Schools Safe! We began the day by meeting in the Youth Zone, which was where we would be based for the day. 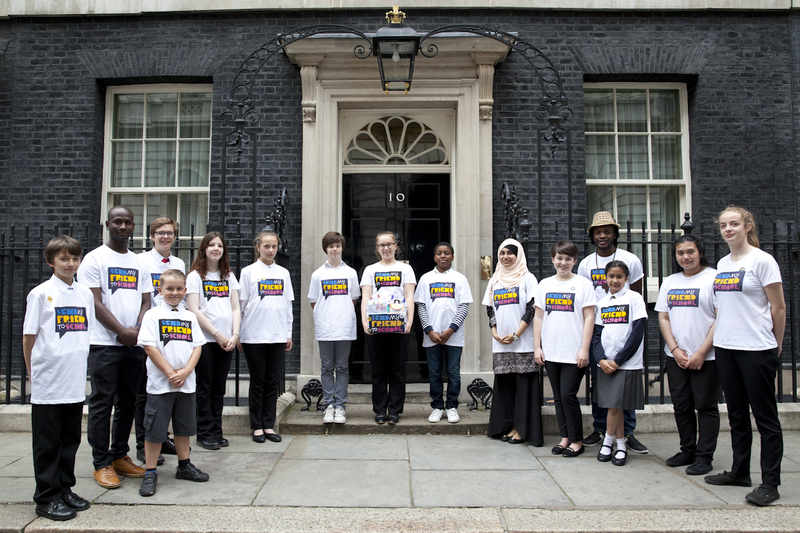 It was here where we would meet some local MPs and also spend the day with Send My Friend Young Ambassadors from Zambia! We spoke to MPs like Steven Twigg and Chris Matheson at a roundtable event about the work that we’d been doing recently including our Action Day in Parliament and getting the U.K. to sign the Safe Schools Declaration. This was very interesting as we got to talk about Send My Friend and get new campaigning ideas from the professionals themselves! After this event we split up and went to watch different talks, all on the topic of teaching and education. I was able to watch Angela Rayner, Shadow Secretary of State for Education, speak about what she thinks we need to do about all children receiving an equal education and about what we can do to relieve students from school related stress. For the rest of the afternoon we walked around the exhibition hall and spoke to lots of different MPs and businesses about our campaign, this was very helpful as it helped to improve our communication skills and also allowed us to meet and connect with lots of new people. After this we went back to the Youth Zone to listen to a Syrian refugee tell his story, he lived in Syria but once it became too violent his mother told him to leave. He was able to get to Turkey on his passport then get in a boat with too many people. Once he was in Greece he had no contact with his mother or family, he was alone after 6 months. Luckily, he got a fake passport and flew to the UK. This was an very emotional story and made us think of how much he had to do just to get away from violence and how lucky we are. After listening to his story, the Oxfam group told us what they were doing to campaign for #FamiliesTogether and how they had been doing work and helping the local area. Overall it was a very interesting day and a new experience for all of us!